Their first ever Market Day, Myaree Ceramics are going all out to welcome you to a fun day out. 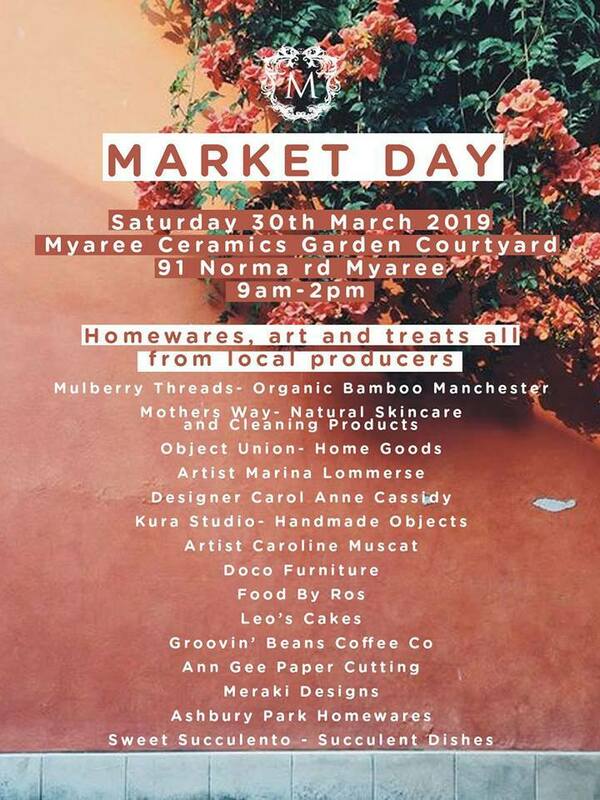 Saturday 30 March 2019 from 9am to 2pm is when you need to be at 91 Norma Rd, Myaree, and entry is FREE. It's all about the home, so if you've been planning on doing some rearranging and updating, come along to have a look at what's new on the market in regard to homewares, art, ceramics and more. Local producers will have a selection of delicious homemade food to tempt your palate. See the event page for updates and stallholders. It's not just all about homewares. Mother's Way uses the finest natural ingredients and essential oils to handcraft a range of pure, natural and organic skincare, bath essentials, aromatherapy, cleaning products and more. Food by Ros will be there when you start getting peckish. A cordon bleu trained chef, you can expect some deliciousness lovingly created. Wash it all down with coffee from The Groovin Beans Coffee Co. Support this 1st ever market for a morning of browsing, buying and relaxing.